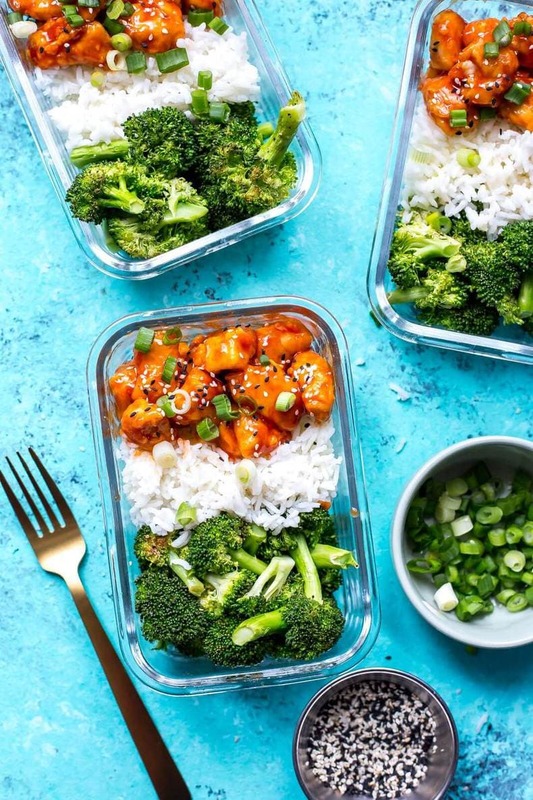 These Honey Sriracha Chicken Meal Prep Bowls with broccoli and jasmine rice are a delicious lunch idea that can be prepped ahead on one pan – and the sauce comes together so easily with only 3 ingredients! A new meal prep favourite, and it's inspired by chicken wings! Yes, chicken wings! Every year my family and I go shopping in Buffalo and stop in at Applebee's. Because food is life and I'm always a pig when I'm on vacation, I get the appetizer sample platter every single time. 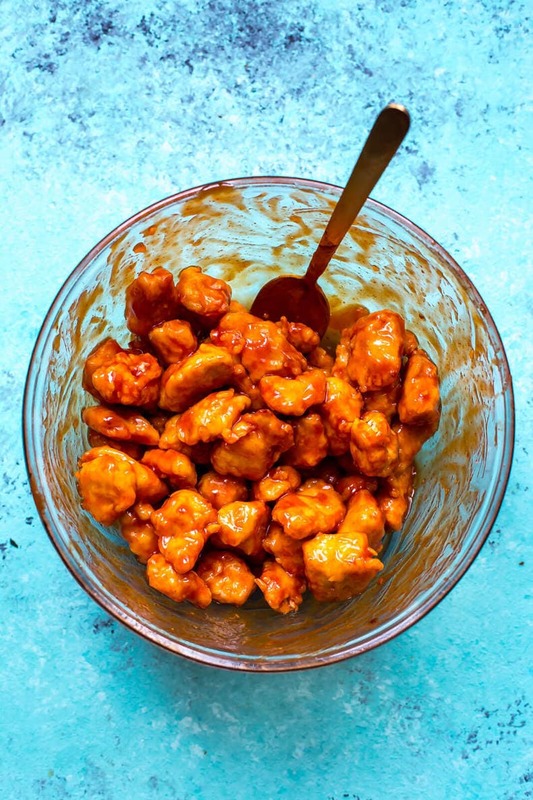 Of course, the boneless buffalo wing bites are my fave, and these honey sriracha chicken bowls are inspired by Applebee's boneless wings, with a delicious, spicy sauce that comes together super easily with ingredients you likely already have at home! 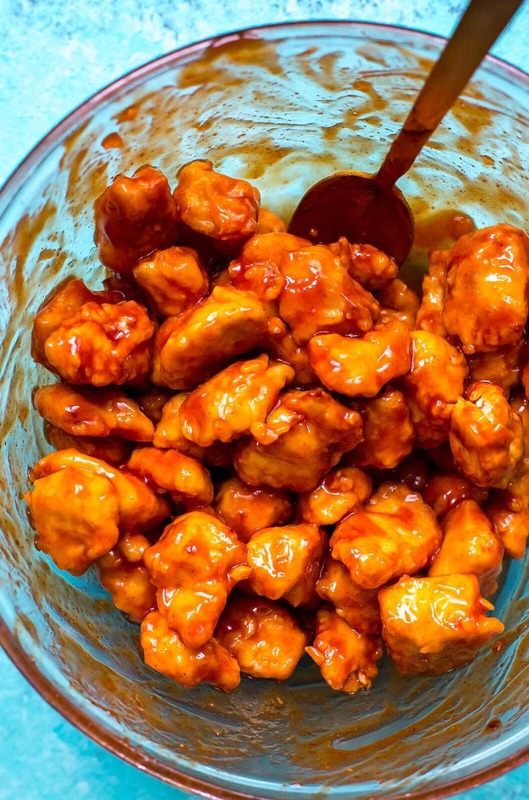 This honey sriracha chicken is super easy to throw together and you get tasty, crispy chicken without having to deep fry it. The key to accomplishing this is by baking in the oven and using the right blend of ingredients to coat your chicken with. You'll toss your crispy chicken in the sauce then pair with some rice and broccoli, or whatever other sides you'd like. Scallions and sesame seeds are also a must for topping but other than that, this recipe is about as simple as it comes when it comes to ingredients. And it's super versatile too so you can switch it up! Is there anything better than wing sauce? I think not! But let's be real, the bottled stuff isn't always the same and you don't always have the motivation to make a wing sauce from scratch, let alone make yourself a batch of chicken wings. So, the girl with the trash taste in food who WORKS in food for a living is bringing you your very own super easy boneless wing bites at home, covered in sticky-spicy-sweet honey sriracha sauce. It's actually deceptively easy: you just need equal parts ketchup and honey (1/2 cup of each), then 1/3 of a cup of sriracha. The sauce IS pretty spicy so if you'd like to cut back on the heat you can just use 2 tbsp of sriracha instead of 1/3 of a cup. It will still give you more than enough sauce without being too spicy. To be honest, if you do like spice a bit you won't find the sauce spicy to the point that it's overwhelming, I'm just saying you may want to watch out if you are very sensitive to spice or if you're feeding kids or something. So anyway! Mix up your sauce in a large bowl while the chicken is cooking. Microwave it for a minute right before the chicken comes out of the oven, then toss the chicken in it (make sure you use a large bowl to get an even coating and to reduce mess). So how did I get these crispy chicken bites to look so bomb?! There really is no secret, other than a little bit of egg and flour! To coat the chicken, you'll dip it in egg first and then toss in flour before adding to a parchment-lined baking sheet. The parchment paper keeps the chicken from sticking and believe it or not all you need is egg and flour to get that crispy coating. No need for extra breadcrumbs, crunched up cornflakes, etc. I've used cornstarch and egg in the past too (like with these Sweet Chili Chicken Meal Prep Bowls) and that works pretty well for getting that coating on the outside of the chicken. You can use panko breadcrumbs after the flour or crushed up cornflakes (like I did with this homemade Popcorn chicken) if you're looking to get some really crispy chicken but it's totally not necessary and will likely be a bit more time-consuming. It's up to you though! Bake in a 425 F oven for 10 minutes each side and that's all there is to it! 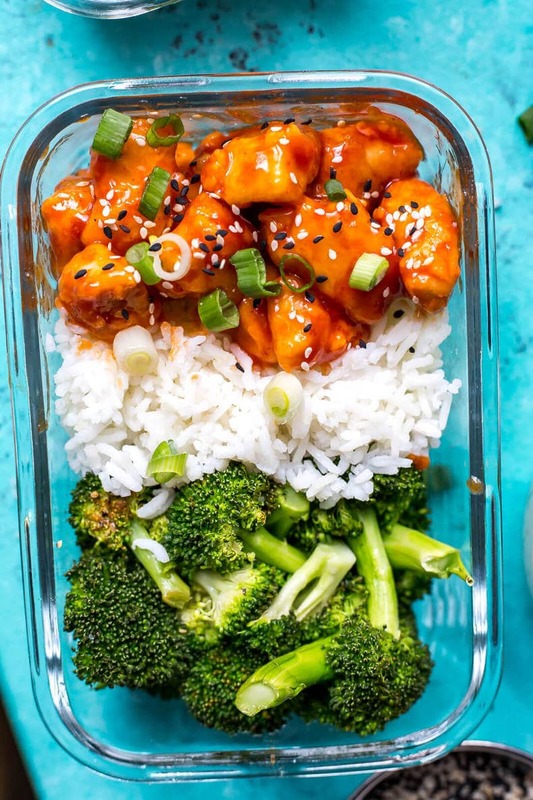 Add in a bit of jasmine rice and some roasted broccoli to your honey sriracha chicken, and you've got one winner of a set of work week lunches. And as easy as they are to make, they're pretty healthy too! If you check out the video, you'll see I cook the chicken and the broccoli on the same sheet pan to cut down on the prep time and cooking materials (I absolutely hate dishes!) and from there it's just a matter of putting in your rice. Drench 1-inch chicken cubes in egg, toss in flour, place on a baking sheet and bake for 10 minutes, remove from oven and add broccoli. Bake another 10 minutes and you're done! So easy! While everything is baking, make sure you've got the rice cooking in a rice cooker too. It'll cut down on dishes and will also save you a ton of time so you can be more hands off while cooking. 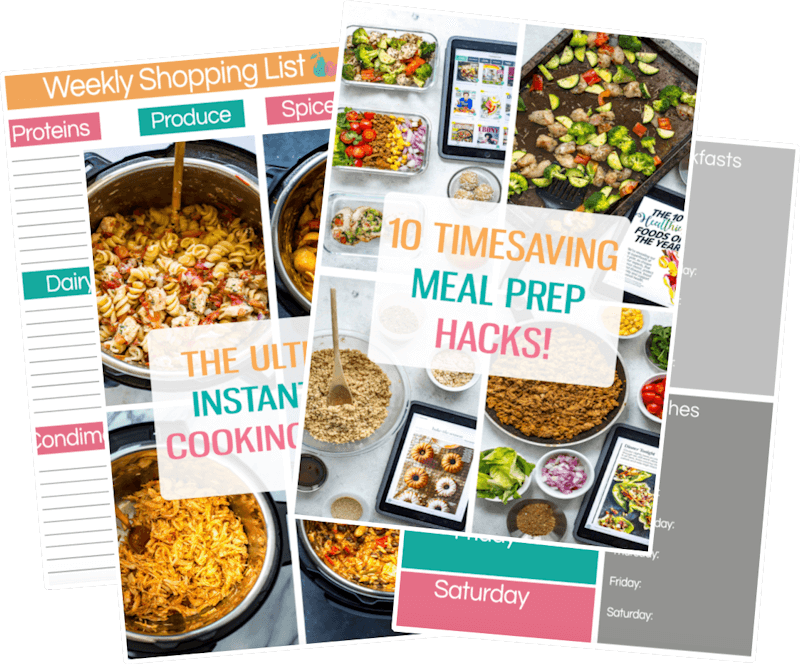 It's super easy because all you have to do is measure out the liquid and rice and the rice cooker takes care of the rest – no burning in a pot on the stove! I've linked my fave rice cooker below in case you're wondering which one I use. 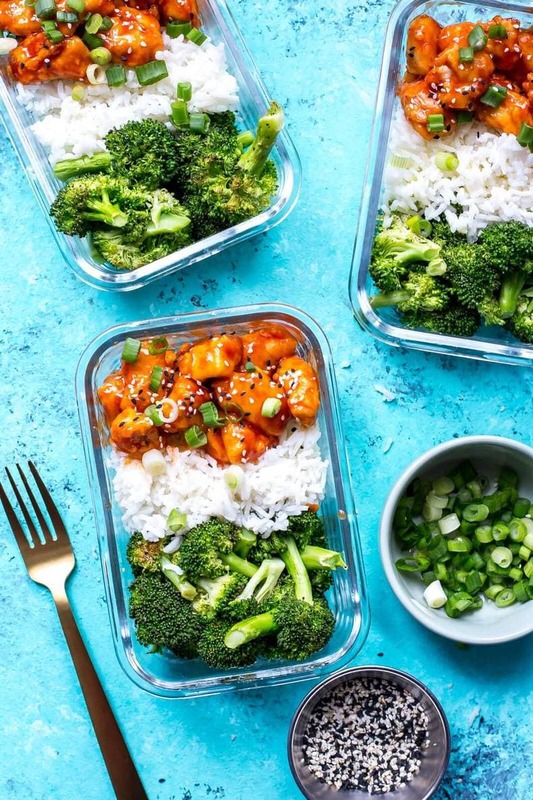 Rice and broccoli are my easy go-tos for any meal prep recipe, but you can totally get creative with the side dishes you add to this honey sriracha chicken. 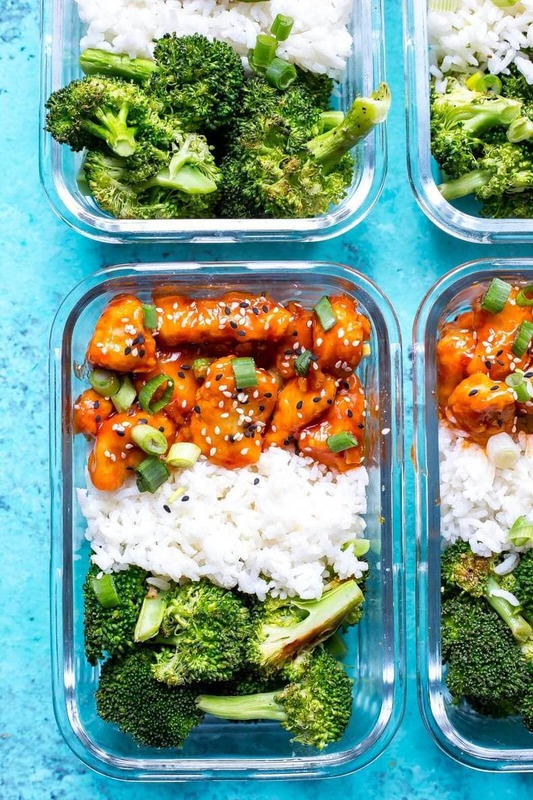 If you're looking to make these Honey Sriracha Chicken Meal Prep Bowls low carb, you can just leave out the rice altogether and double up on the chicken or broccoli, or use cauliflower rice. You can also add in an extra veggie like red pepper. Really, this is such a versatile recipe that you can clear out your vegetable crisper and just add in whatever you have on hand. Most veggies will cook in the last 10 minutes in the oven alongside the chicken so there's no need to dirty up any more dishes or saute anything, so go ahead and get creative! One thing I've been doing when I have time to meal prep on a Sunday as well is cooking rice and grains like quinoa ahead of time so I can just throw them in alongside a recipe that needs them. 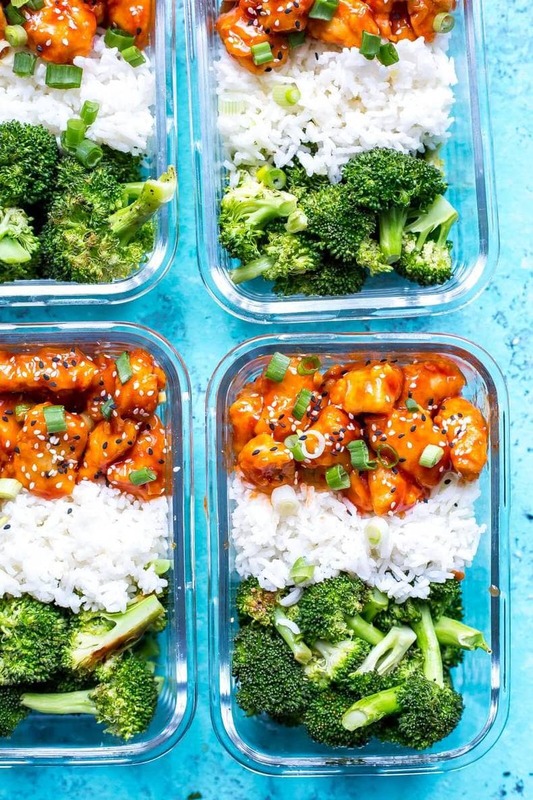 Will you be making these Honey Sriracha Chicken Meal Prep Bowls? You gotta get on the meal prep train if you aren't already…any excuse to have delicious lunches all week is a-okay with me!!! And these are basically like boneless wing bites. OMG so good! 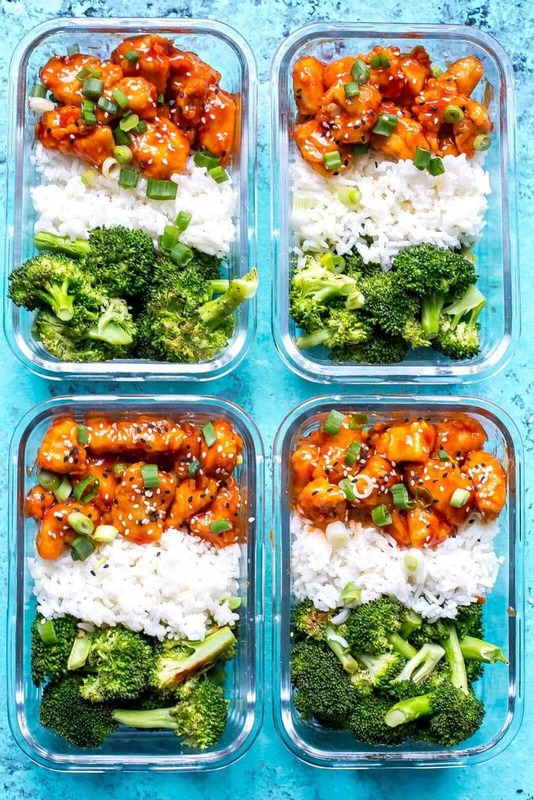 These Honey Sriracha Chicken Meal Prep Bowls with broccoli and jasmine rice are a delicious lunch idea that can be prepped ahead on one pan - and the sauce comes together so easily with only 3 ingredients! Preheat oven to 425 F. Add egg and flour to two large separate bowls. Drench chicken in egg, then coat in flour, shaking to get off any extra flour. 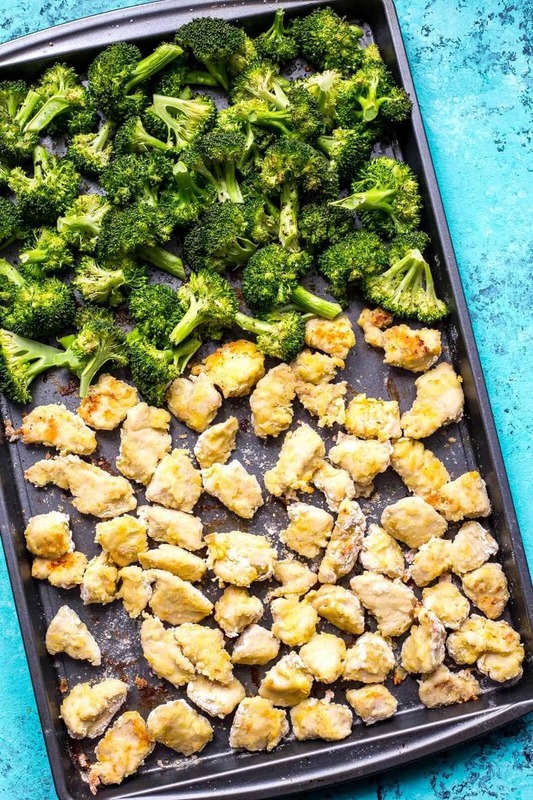 Grease a non-stick baking sheet with cooking spray or olive oil (about 1/2 tbsp) then add chicken pieces, leaving a bit of extra room for broccoli at one end. Bake in the oven for 10 minutes. Meanwhile, cook rice in a rice cooker or according to package directions (you want enough rice for two servings). Chop broccoli florets. Remove chicken from oven and flip, then add broccoli and drizzle with olive oil (about 1/2 tbsp) and season with salt and pepper. Place back in the oven for another 10 minutes. While everything is finishing cooking, mix together sauce ingredients then microwave for 2 minutes until sauce is slightly thickened. Remove chicken from oven and toss in sauce to coat. Add all ingredients to meal prep bowls then top with green onions and sesame seeds (optional). Serve and enjoy! Hi Taylor, I absolutely love your recipe ideas. I’ve tried lunch in mason jars before and they were brill. 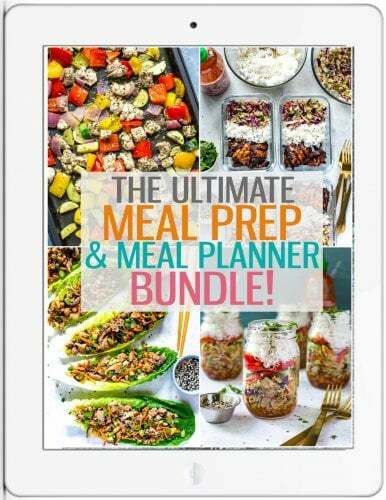 I want to try the sheet bake method, but I just wanted to ask how long your prepared meals last (unfrozen)? I would think a salad in a jar might go bad after a day or 2, so I had only ever done it the night before. As someone struggling with an eating disorder, it is much better and healthier for me to organise, but larger meals can sometimes be difficult for me to portion up. I could do with some of your will power in this aspect. Thanks for the inspiration! Hi Taylor. I absolutely love your recipes! Thank you for sharing them. They are on regular rotational in my house. Made this tonight. It was really good (but a little hot for my taste, so I’ll adjust it next time). It was easy to make. Thank you for the recipe! Hi Taylor. Am new to the concept of meal preps but am keen to try. Problem is we are a household of 4 so they would all be gone in one go and wanted to change up the meals each day. Do you think these would freeze so I could do larger batches and rotate? Or do you think the broccoli would suffer ? Thanks so much. Could I do this without the siracha? Isn’t ketchup all sugar? Honestly I wouldn’t recommend making this without the sriracha – you need the heat and the ketchup would be overwhelming.